As long-time, local, small business owners on the North Shore of Lake Tahoe, we’d like to take this opportunity to remind our community and decision-makers holding the purse strings to millions of tourist-generated dollars, that supporting our workforce is vital to a healthy local economy. Our economy is tourist driven. We all know this. But, the engine behind this economy is our dedicated workforce. Without the workers who make beds, wait tables, build houses, rent snowboards and paddle boards, our economy wouldn’t hum like it does. We also know that living in North Lake Tahoe is challenging for all of us. For our workers, especially for those making minimum wage, rents are high, food costs are high, winters can be tough, work is seasonal and public transportation is limited. The only way our workforce stays healthy, fed, safe and cared for is through the work of several critical local non-profits who provide a wide range of basic needs services: health and nutrition education, social services, domestic violence counseling, and emergency food distribution. A new model that is cost effective and improves services is currently being built in Kings Beach — Community House. Community House, located on the corner of Bear and Trout Streets, will be a one-stop-shop for services. What a brilliant business model. Our neighbors will be welcomed there, can take parenting classes, get counseling, legal services, food to make it to payday, and connect with people about resources in the region, all in one place. This makes so much sense. It will stretch precious resources of the non-profits housed there (Tahoe SAFE Alliance, Project MANA, North Tahoe Family Resource Center) and ultimately provide better services for community members and local employees. It’s exciting the community has rallied to support “CoHo” — $1.9 million is needed to turn a blighted hotel into a community center housing critical services; $1.4 million has been raised through private donations and grants from public agencies, foundations and generous community members. To cut the ribbon on Community House this September, our team of community leaders needs to raise the final $400,000. 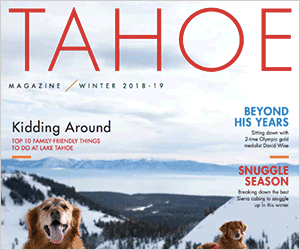 At their June 5 Board meeting, North Lake Tahoe Resort Association is considering using TOT funds (generated through a tax on lodging) to close the funding gap on Community House. The community benefits that qualify for TOT funds are clear; the curbs, gutters and sidewalks of the KBCCIP, the 15 needed parking spaces, the community meeting rooms, the revitalization of a blighted site and the health and well being of our workforce. As community members, local business owners and residents, we urge you to join us and let NLTRA Board members know that supporting Community House keeps our work force healthy and our local economy strong. Please send a letter or email NLTRA Board members and urge them to vote yes to allocate $400,000 of TOT funds to this critical project. Dave Wilderotter is owner of Tahoe Dave’s Skis and Boards; Pam Jahnke is owner of Tahoe Mountain Sports; Cris Hennessey is owner of Hennessey Heating; and Douglas Dale is owner of Wolfdale’s Restaurant.